Monitoring servers from stopping operational because of disk full is a very critical and in the same time is tedious job. However, if we can automate it and send the report to our mailbox every day that will be awesome. 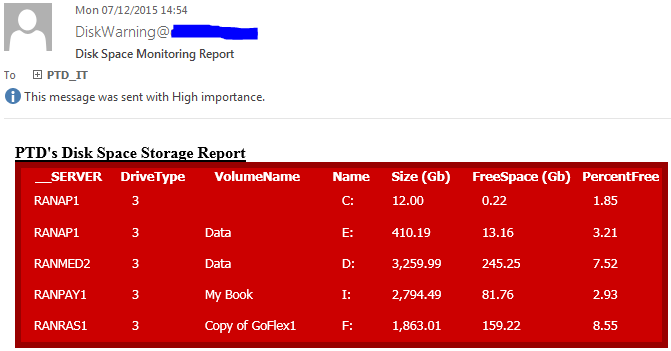 The Disk performance from Microsoft can be configured to pop up on the screen when disk nearly full but I personally prefer alert to be sent do my email, so whenever I go I can always know the disk free situation on the servers. The other reason is usually when we have a pop-up warning on our screen that is already too late, but if we set if far too early we usually ignore it. I combine the PowerShell script with windows scheduler to send the warning every morning so we can act accordingly. Subscribe to my newsletter to receive the script with result exactly as in the picture above.